If you collect Japanese movie posters perhaps you’ve encountered the tall, slender Japanese STB format before — it’s hard to miss at nearly 5’ tall! Standard Japanese B2 posters measure approx. 20” wide by 29” tall. These awesome posters are made from (2) overlapping B2 posters giving you approximately 58” in overall height. In English-speaking countries they are most commonly known as STB posters, but are sometimes alternatively called tatekan or tatsumi posters. In Japan they are referred to as 立看 映画ポスター, which translates to “standing movie poster” or “signboard movie poster” — for good reason as we will learn. In Japan, it is extremely common for movies to be advertised in designated poster display cases in numerous locations throughout towns and cities. While each display case is different, they typically accommodate both standard size B2 posters as well as STB 2-panel posters. Because STB posters are twice the area of a standard B2 poster, this added a degree of promotional flexibility — they could either display (1) STB poster or (2) B2 posters in the same space. Below are some historic photographs of movie poster display cases from Japan — some are very informal. STB posters were not only used in standard display cases. 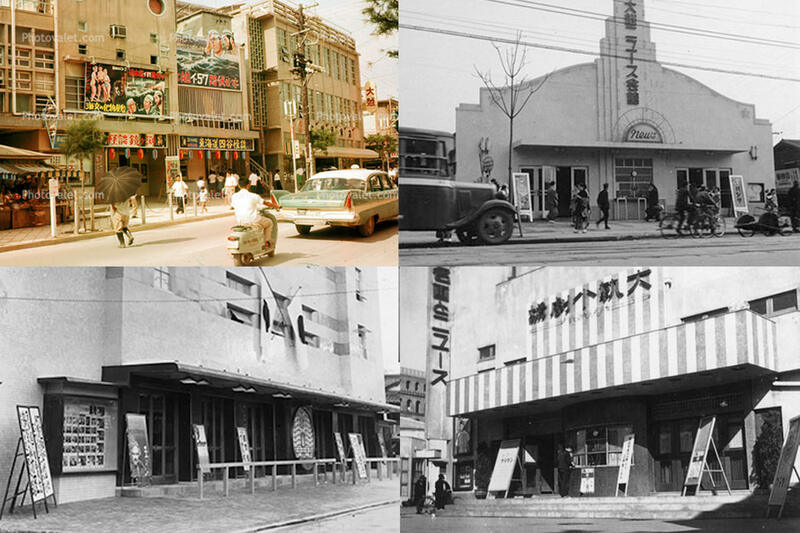 As these vintage pictures show, STBs were also used alongside ticket booths and, due to their tall slender shape, as movie theater door panels. However, by far the most common use for STB posters was in a sandwich board-style, free-standing display case. Perhaps this is how they got their “STanding Board poster” English moniker? Since the earliest days of cinema in Japan STB posters were displayed very close to the roadside — oriented so they would be visible to both pedestrians and passing motorists alike. STB posters have been a fixture of the Japanese cinema promotion since at least the 1920s, if not earlier. It’s no surprise really, as the STB poster format is a direct descendent of one of the oldest forms of “advertising” in Japan — the nobori (幟) banner. Nobori are long, narrow flags, attached to a pole and were common place on the battlefields of feudal Japan. Because they have a cross bar to hold the fabric straight, they can never been twisted around the rod like a normal flag and therefore were always visible and identifiable on the field of battle. How these soldiers fought with a giant flag stuck in the back of their pants, however, I will never know. It definitely gives new meaning to the term “direct marketing”! Marquee Poster is proud to offer some of the rarest titles in this already extremely rare format. Due to their unique size they can make a big impact in a small space, requiring only 20” of wall width. Please use this search to see our whole collection of Japanese STB movie posters.